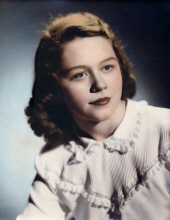 BAIR, Mary Margret, age 90, of Warren passed away Saturday, April 6 2019 at home. She was born in Fort Wayne, Indiana on August 04, 1928 to the late Charles and Gertrude Miller. She is preceded in death by her husband Joseph Bair, and sister Nancy. Loving mother of Richard (Kim) Bair, Charles (Sharon) Bair, Mark (Kathleen) Bair, John (Fawn) Bair, Dan Bair and the late Michael Bair. Caring grandmother of Becca, Chris, Dylan, Erica, Jessica, Lesley, Marie, Mat, Natasha and Olivia, and also a great grandmother to Anne, Cruz, Elizabeth, Ellie, Lucas, Margo, Mason, Mikaela and Sam. She will be dearly missed by many nieces, nephews, relatives and friends. Mary Margret was a graduate of Oakland University with a Bachelor of Science degree. She earned her teaching certification and worked for many years as a teacher in the Archdiocese of Detroit. She taught at schools in Detroit and Royal Oak where she truly loved teaching and interacting with her students. At home, Mary Margret enjoyed her monthly bridge club, which she participated in through 2018. Although, she claimed to rarely have had a decent hand, she enjoyed the conversation and fellowship with her fellow players. She especially enjoyed spending time playing games, teaching, and trips with children of all ages, especially her ten grandchildren and nine great grandchildren. Mary Margret was active at St. David's Episcopal Church.in Southfield, where she and Joe were long time members. Mary Margret taught Sunday School classes for many years and held positions on the Church Vestry. Memorial visitation will be held on Monday, April 22nd, 2019 from 10:00 AM until the time of funeral service 11:00 AM St. David’s Episcopal Church, 16200 West 12 Mile Rd. Southfield, with Father Chris Yaw officiating. To send flowers or a remembrance gift to the family of Mary Bair, please visit our Tribute Store. Guaranteed delivery before Mary's visitation begins. Guaranteed delivery before Mary's service begins. "Email Address" would like to share the life celebration of Mary Bair. Click on the "link" to go to share a favorite memory or leave a condolence message for the family.